Select Print Medium Fine Art Paper Canvas Select a Size 15x11 in. 21x15 in. 36x26 in. 42x30 in. Mahlstedt Gallery is very pleased to offer limited edition prints on Fine Art Paper of our represented contemporary works of art. Most of the beautiful original work that we show through the gallery can be yours in a choice print, available in a wide range of sizes to fit in your space. Our diverse line of original artwork is professionally printed on museum grade Fine Art Paper that won’t fade or yellow. Mahlstedt Gallery limited edition Fine Art Paper prints are produced on our state-of-the-art professional color printer that replicates the finest detail. Our expert printers hand-number and seal every print with the Mahlstedt Gallery seal of authenticity. We roll and package each piece with care and include white gloves, to make it easy for you to maintain and enjoy your beautiful limited edition fine art! Mahlstedt Gallery takes great pride in the craftsmanship of our artisan canvases, hand-stretched to perfection in the USA. Our gallery canvases are stretched on North American basswood, known for its stability and the wood of choice used in museum exhibitions. Mahlstedt’s professional crafters stretch all canvases meticulously, with close attention to symmetry and seamless edges. Each canvas is measured in proportion to the original artworks, to produce highly detailed editions that are both classic and contemporary. Our canvas prints come equipped with a sawtooth hanger and white gloves, making it easy for you to install and enjoy your beautiful limited edition fine art right out of the package! Our fine art limited edition prints are made-to-order by our own expert in house staff, inspecting each piece to make sure it has been made to perfection. We use only premium materials. We love art and care about it! Mahlstedt gallery is proud to be 100% made in the USA!! All Mahlstedt Gallery prints are made and assembled in the USA at our gallery in New York. Browse our extensive and professionally curated collection; find the perfect match for your artistic goals. Shipped from our New York gallery or directly from the artist’s studio, safe and timely delivery to your doorstep is guaranteed. Original artworks come ready-to-hang, simply unpack and enjoy. Carol Aldrighi is an illustrator who predominately works digitally, though she enjoys expressing creativity through various activities and media and always has since she was a little girl. She is inspired by anything that's around her and lets her mind wander and imagine abstract and colorful scenarios to give life to. She keeps notepads with her and always sketches out any design that comes to mind so it doesn’t get lost. All of her works have a more-or-less hidden message and while drawing, she feels like she’s infusing it into the artwork. Her works have some kind of layered structure that may not be noticed at first glance. There is a first layer, the surface, which is the actual artwork you see the moment you lay your eyes on it. Then behind it and within it, there always is a deeper meaning and if somebody manages to get it or even to just feel something while looking at it, the artist is happy because it means there's been a connection: that thing that was once only in her mind has now said something to another person. The main theme of all the works in the "Kitsch-en" series is a visual representation of food-related common sayings, with abstract meanings, surreal depictions and a lowbrow-inspired color palette. For this collection, the artist drew inspiration from pop art, surrealism and vintage food ads. 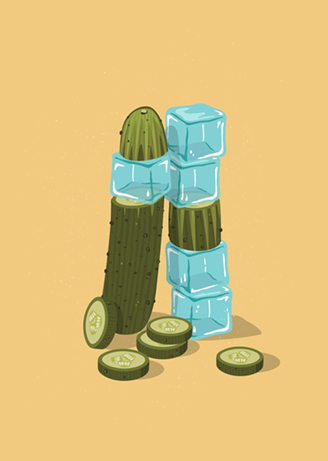 Refreshing reminder that even in hot weather, the inside of cucumbers remains cooler than the air. 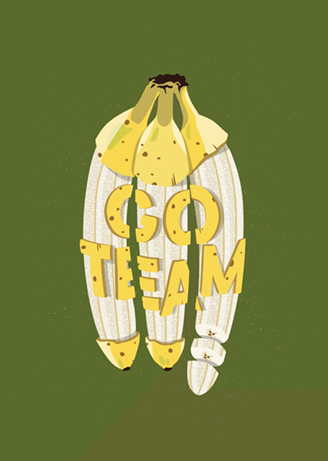 The banana fans are, for all intents and purposes, crazy about their team. 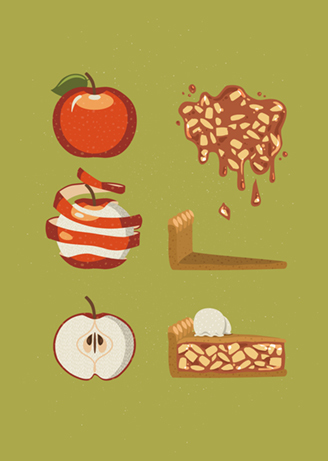 To be in apple-pie-order means to be in perfect order. Enjoy an apple pie in apple-pie-order! Shipping to addresses in the continental US is FREE. All products are shipped by common carrier from New York. International and non-continental US shipping is available. Shipping methods vary for originals and prints.